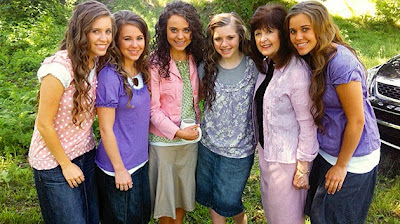 Duggar Family Blog: Duggar Updates | Duggar Pictures | Jim Bob and Michelle | Counting On | 19 Kids: New Episodes? march seems so far along!!!!! Wow March...that's a long time...I really miss y'all....y'all have already been off about 2 months...know y'all are super busy...God bless!At least I can keep up with u here..Love Elizabeth..
That is a long hiatus after a 5 week season. Yeah! Can't wait for the new season to come out. Ugh! once tagain another late start to the show,shorter seasons as soon after the show will stop for the summer break. then probably break early for the christmas season. Dont know why they are dragging on the inevitable. End the show already. Exactly what I was thinking. There has been no memorible moments in these short seasons. I know life can be routine but the last season I found it hard to stay interested. Births are beginning to become boring and the same. Erin wedding and jessas courtship will only be kept this show afloat for so long. I agree its time to end it. Id be happy with update specials once a year or so. Wow, March? :-( We were hoping for January. Look forward to watching the new episodes, though. Most of us are cheering for you....you are sure loved and appreciated!Know y'all stay so busy and really glad you are allowing us in YOUR 'livingroom'.The seasons are too short for your supporters and the breaks too long...but know you are so busy so THANK YOU for having us as your guests!God bless..Love Elizabeth. I wonder if the delay is to help the newly engaged couple have some much needed privacy? That would be a possibility IF they were engaged. but they are not. BIG difference. Their book comes out 4 March, so the new season will coincide with that, it makes sense. i hope they end the show they need a real life. what kind of jobs do these girls hold? do Jana and Jill get paid for doing midwife jobs?. what about John David and Joesph how do they support themselves. How will michelle and jim bod support themselves if the show ends.. If u knew anything about the Duggars, you would know the answer, do your homework and u just might b pleasantly surprised! Bless u. This family was successful financially way before the show started, you would know that if u knew anything about this family,as for JohnDavid, he has his own towing company.This family has never relied on handouts,government funding, or charity.They have worked hard and made it on their own quite successfully. Their show is strictly for a ministry and educational purposes, do your homework before you talk rubbish. Oh yeah, the girls finantial status is none of your concern. Live your life with the grace of god, and peace b with you. I'm bummed we still have a few months left of waiting, but am looking forward to it. The Duggar family is inspirational. I've been waiting for the season 6 DVD. Usually a new season starts selling in the fall, but nothing new came out this year. :( I'm so glad to hear there is another season starting in March, and look forward to their new book as well. They had 17 kids and built a home debt free before they began their TLC show. I am pretty sure they can manage to support 18 kids without the show. I agree with anonymous 20 and 21; restarting new episodes in March is crazy. The daughter's book is of no interest and the huge delay does not create excitement for their show. Ending the show is the best idea. Develop a few specials now and then. And even if Ben and Jessa were engaged; big deal. He is very young for her with limited means to support her and a family. Their courtship should be just that-a courtship, not a relationship. I enjoy watching your show so much. Your family has such strong family values, it is an inspiration to witness. I am also looking forward to reading the new book written by the girls. God bless your family. Looking forward to the new episodes!!!! Netflix.I didn`t even know that Josh and Anna had 3 kids! I am so excited for the new season 2014! I love your show! So thankful your family shares your lives with all of us. Michelle, as a mother of 5 you have inspired me to be more soft spoken with my children, more attentive to them and my husband, and to look more to the Lord for all the answers. Thank you, thank you, thank you!